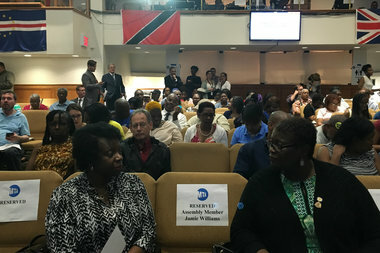 Canarsie residents turned out a hundred strong on Thursday evening to hear what the MTA had to say about the L train shutdown. CANARSIE — MTA officials on Thursday night dispelled rumors that the entire length of the L train would shut during repair work needed to fix the subway tunnel connecting Brooklyn to Manhattan, assuring those in Canarsie that Brooklyn service would still operate. "There is this rumor out here, that the L itself entirely has to shut down," Veronique Hakim, president of NYC Transit branch of the MTA, said at the start of Thursday's public meeting, held at Beraca Baptist Church in Canarsie. "That's just not the case." "Sixty-four percent of our L customers never use the Canarsie tunnel. They're concerned with what's happening in Brooklyn," said Hakim. "For those customers we're here to say, you're going to travel basically the same way you travel today." State Sen. Roxanne Persaud said she too had been fielding the same types of concerns from worried constituents saying, "'Oh my gosh, they're going to shut down the L line." "From our office we're saying, 'No they're not going to shut down the L line.'" Commuter Donna Hayles who travels from Canarsie to the Upper East Side every day said she'd come to Thursday's meeting with that same misperception about repairs. "I was trying to think of what I was going to do," Hayles said. The MTA needs to repair the Canarsie Tunnel that connects Manhattan and Brooklyn because of damage done during Hurricane Sandy. Because of the extent of the repairs needed, they'll have to either fully shut down the tunnel, or shut down one tube at a time. Either way, construction work won't begin until 2019. A full shutdown of the tunnel would mean no service between Bedford Avenue and 8th Avenue for 18 months, with no service at all in Manhattan during that time. A partial shutdown would take about three years, and L trains would run in two segments during that time. From Canarsie to Lorimer, trains would run almost normally, while trains between Bedford and 8th Avenue would run every 12 to 15 minutes allowing for about one-fifth of the current ridership. Shuttle buses would run between Lorimer and Bedford, although riders before Lorimer would be encouraged to transfer to other lines and avoid taking the bus. News that the Canarsie Tunnel needed extensive repairs leaked to the press in January, but it wasn't until early May that the MTA came forward with more details about what the construction work would entail. Since then, much of the informational push has been geared on North Brooklyn riders with a public meeting in Williamsburg and another near Union Square. One Canarsie commuter worried the MTA's outreach to the neighborhood came too little, too late. "They're shutting the barn door after the horse has already bolted," said Arun Aguiar. "Right now everybody is frightened. It's going to take a long, long, long time to persuade even the people willing enough to listen." One bright spot during Thursday's meeting was the announcement that the MTA is working on getting a free transfer between Livonia on the L and Junius Street on the 3 train. The Canarsie audience burst into applause. "It should have been done before," MTA Chairman Thomas Prendergast said. By the conclusion of the meeting, most of those gathered largely opted for a full shutdown of the tunnel. The L train is "my life, it's my clients' life, my daughter's life. ... I know the impact," said Carol Killiebrew, a financial adviser for small businesses in the area. But, "who wants to keep pulling out a tooth for three years?" Familiar with the destruction flooding can cause, Killiebrew said her own home was destroyed during Hurricane Sandy and that she and her family have lived in hotels and multiple apartments since. "After Hurricane Sandy people were devastated," she said. "This will impact people but it won't devastate them." A fourth meeting is planned for Williamsburg on June 9 at Swinging Sixties Senior Center located at 211 Ainslie St.